StarLadies Racing Attracts Women to the Winner’s Circle: As you look around your favorite track you may notice flocks of female fans enjoying the day around the paddock or better yet in the Winner’s Circle accepting the trophy for their champion horse. 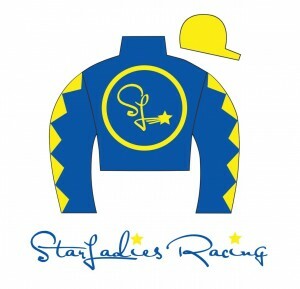 StarLadies Racing is a new partnership opportunity for female racing enthusiasts that we’re hopeful to see celebrating as the group’s two-year-olds are scheduled to hit the track later this year. Not only does StarLadies Racing make it easy for a gal to be part of owning fillies within an intimate group, the organization is modeled after one of the most successful thoroughbred partnerships in the business, Starlight Racing, which is sure to produce winners. StarLadies Meet & Greet last August, hosted by Laurie Wolf, pictured on the far right wearing a corral necklace, at the Wolf’s home in Saratoga prior to a Day at the Races. 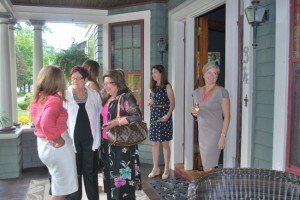 Founding partner Barbara Lucarelli is pictured in the center with the brown handbag. Going back to 2012, Barbara Lucarelli and Laurie Wolf, two of the founding partners in Starlight Racing, had tossed around the idea of having a female-only partnership–buying only fillies and having only females in the group. They thought this would be a fun (and, hopefully, rewarding!) way for a group of like-minded women to share and enjoy their mutual passion for racing. The inaugural StarLadies partnership was launched in 2013, with the purchase of 5 yearling fillies that are on track to make their 2-year-old debuts later this year. The 2013 StarLadies partnership consists of nine partners. These women come from all across the country and all share a passion for horses and racing! 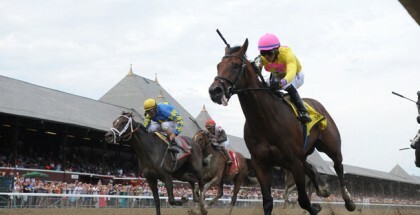 StarLadies will form new partnerships each year for purchases at the three premier yearling sales (Fasig-Tipton July, Saratoga Select and Keeneland September), just as the Starlight core partnership does. Since StarLadies Racing wants to maintain an intimate relationship with their partners, they plan to keep each group small (9-12 partners). 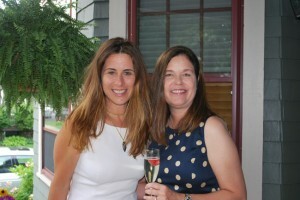 StarLadies partners Allison Moses (left) and Leigh Butler enjoy the StarLadies meet & greet hosted by Laurie Wolf. The current StarLadies partners are very diverse in their lifestyles and interests. They are entrepreneurs, businesswomen, moms, grandmothers…and everything in between! Most of them have had some prior experience with owning racehorses and even the ones who are new to horse ownership have participated in racing and/or partnerships with their husbands. Six of the nine current StarLadies partners participate in the Starlight core partnership with their husbands. The StarLadies Racing partnership is small and intimate enough that each member has the opportunity to name the current crop of fillies. Each partner submits name suggestions, and Donna Barton Brothers and Laurie Wolf try to match them up with the fillies and have each partner represented in the names (depending on the number of fillies and partners). Hopefaithjoy (Lookin At Lucky – R Lady Joy, by Vicar) is currently at Payton Training Center and will make her two-year-old debut later this year for StarLadies Racing. StarLadies is modeled after the successful Starlight Racing partnerships. Jack and Laurie Wolf founded Starlight in 2000, with Donnie and Barbara Lucarelli joining as principals in 2004. Over the years, Starlight has been fortunate to achieve a high level of success, ranging from multiple Grade 1 winner Harlan’s Holiday (who was in the Wolf’s first crop of yearling purchases), to two-time Eclipse Award winner (and Kentucky Oaks winner) Ashado, 2007 Kentucky Oaks runner-up Octave, and 2012 undefeated 2-year-old champion Shanghai Bobby. The StarLadies Racing silks will hit the track later this year as the first crop of fillies make their debuts. Any women who would like more information on StarLadies are welcome to contact Donna Barton Brothers, Starlight’s Chief Operating Officer whose focus is on client relations and partnership development for Starlight and StarLadies Racing. She may be reached via Donna@StarlightRacing.com or 502-645-2232 and would be happy to answer any questions. StarLadies does ask new partners to join at a 10% level of commitment to the overall partnership for that year. Lady and The Track wishes StarLadies Racing the best of luck during the debut season of their fillies! Be sure to visit StarLadies Racing for more information. You can also follow StarLight Racing on twitter and facebook.